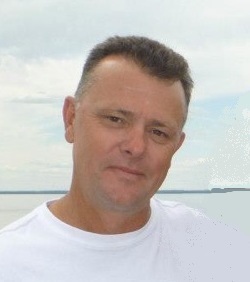 Sherwood: Michael “Mac” Richard Kroiss, age 56, passed away doing what he loved – snowmobiling on Saturday, February 9, 2019. He was born on November 18, 1962, son of late Mary and Frank Kroiss Sr.
Mac enjoyed life to the fullest. He enjoyed snowmobiling, motorcycle riding, boating, golfing, bowling, and absolutely anything done outside. Mac was not to be kept down, he enjoyed working hard, playing hard and spending time with family and friends. Mac had time for everyone, visiting local farmers and helping the neighbors. If there was a job to be done, he would be there lending a hand. If you met Mac, a relationship was formed. On August 1, 1992 he married the love of his life, Lori (Gorges) “Mint Wife.” Together they had two daughters, Aubrey (Max Crabb) Kroiss, Appleton and Amanda (Austin Werner) Kroiss, Sherwood. He is further survived by his three brothers, Frank Jr. (Carla) Kroiss, Darboy, Ken (Vicki) Kroiss, Appleton, Dan (Chris) Kroiss, Sherwood and two sisters, Mary Kay (Brian Simpson) Easton, Neenah and Peggy (Randy) Conrad, Freedom. Sister-in-law, Nancy Kroiss and brother-in-law, Mike Frahm Sr. He is further survived by his Aunt Joyce Wittmann. In addition, the following nieces and nephews: Bob (Julie) Reinke, Jodi (Tim) Schumacher, Tami (Jeremy) Morrow, Amie (Brian) Giese, Alyssa (Paul) Vandenberg, Emily (Ted) Tickler, Matt Anderson, Katie Anderson, Michael Jr. (Tasha) Frahm and David (Alaina) Frahm, Christopher Easton, Allison Easton, Ryan (Megan) Steinberg and Jon (Megan) Steinberg, Brandon (Erin) Conrad, Amanda Conrad and Britny (Andrew) Babler. He is also survived by his mother and father-in-law, Art and Noni Gorges. Two sister and brother-in-laws, Annette (Del) Meyer, Karen (Tom) Gunville and brother and sister-in-law Al (Sue) Gorges. The following nieces and nephews, Kassie (Joel) Poye, Luke (Jenna) Herbst, Kyle (Amanda) Herbst, Miranda Meyer, Kaitlyn Gunville, Jacob (Tim) Gunville, Colton Gorges and Megan Gorges. He was preceded in death by his mother and father, Mary and Frank Kroiss, Sr., a sister, Susan Frahm and a brother, Richard Kroiss. Visitation will be held on Wednesday, February 13, 2019, at the Verkuilen-Van Deurzen Family Funeral Home KAUKAUNA location, 2401 Fieldcrest Drive, Kaukauna, from 4:00 p.m. until 7:00 p.m. with a service concluding the evening. Visitation will continue Thursday, February 14, 2019 at Sacred Heart Catholic Church, N369 Military Road, Sherwood, from 9:00 a.m. until the time of the Mass at 11:00 a.m. Interment will be in Holy Angels Cemetery, Darboy. In lieu of flowers, a memorial is being established in Mike’s name. For online condolences, please visit www.verkuilenfh.com. The family would like to extend a huge thank you to Cory Roehrig for being at Mac’s side in his final moments. The family finds strength knowing he was not alone. Thank you to the DNR and other emergency personnel that were immediately on the scene assisting Mac. Your efforts were greatly appreciated.